30 x 30cm oil on linen. Elderflower cordial is the essence of summer sunshine, bottled. 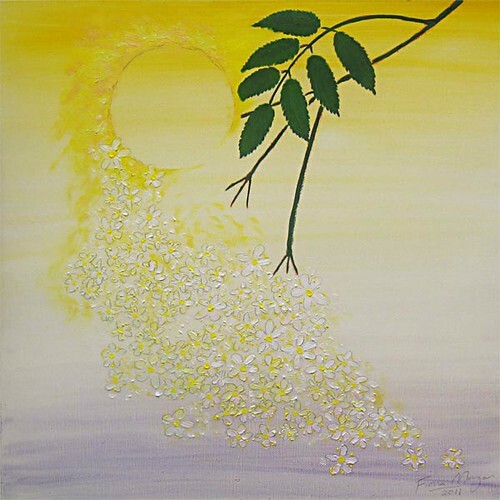 Can you feel the glimmers of elderflower sundrops cascading down? 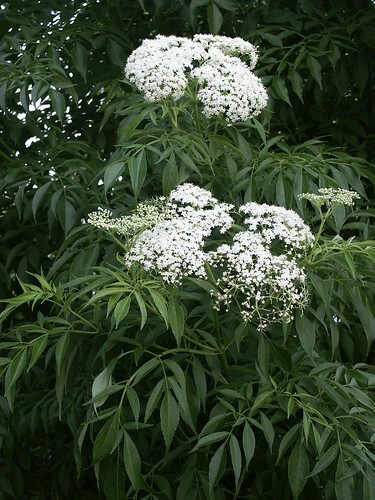 Elderflower cordial is made from the flowers of the elder tree (sambucus nigra) in summer. Elderberry wine is made from the berries that grow from the flowers in autumn. This cordial / syrup / squash is wonderful as a mixer in simple cold summer drinks. It's simple to make and far far cheaper than buying a commercial version, if one is even available where you live. I struggle to find it in shops where I am, yet can think of at least three abundant elder trees within two minutes walk. So I make it myself. I first discovered this drink while living in Edinburgh. Just like summer there, the elderflowers don't stay around long enough. 30 heads of elderflowers - the elder tree flowers at the beginning of summer for only a few weeks. That's early December in the southern hemisphere, and early June in the northern. The best time to pick the flowers is on a warm sunny day when the flowers are fully open and when the pollen is at it's height. I've also read that mornings are a better time for picking as by evening the flowers can smell like cat pee, but I haven't personally found this to be the case. It may depend on individual elder trees. At any rate, the flowers should smell heavenly when you pick them. If not, try a different time or different tree. 1kg sugar- yes this seems like a lot but I have tested using less and this amount was the clear flavour winner. Also sugar acts as a preservative, so a large amount means this should keep on the shelf. 55g citric acid - here in Australia this is available in supermarkets in the baking section. I'm told in the UK it is available in chemists. If you get a strange look while purchasing it's because heroin users make use of citric acid, for exactly what I'm not sure. Rest assured that citric acid is a very normal ingredient in cordial making! I've read that tartaric acid can be used instead, according to personal preference, but I am yet to test this. First clean and sterilize all the cooking implements. It's easy, all you need to do is give them a normal wash, then a quick wash in diluted bleach and finally a rinse under very hot or boiling water. This may be overkill for cordial, but as with all preserves, it's heartbreaking to go to the effort of cooking and bottling only to find three weeks later that everything is growing mould because you couldn't be bothered sterilizing an item. I needed to use a chopping knife, chopping board, grater / zester, giant pot and lid, stirring spoon, 1L bottle, funnel, sieve and fine mesh muslin. To make the cordial, put the water and sugar in the pot and heat while stirring until the sugar has dissolved. Put the lid on the pan and leave it to cool to at least luke warm or cooler. Zest all the lemons and oranges and add the zest to the pot. Then slice the lemons and oranges, discard the ends and add the whole slices to the pot. Gently shake the elderflowers clean of debris and insects over a sink or bowl or bin and add the entire flower heads minus any leaves to the pot. Do not wash the flowers as you will lose all the lovely scented pollen. Give the pot a good stir, cover with the lid and leave for 24 hours. Next day, after giving your hands a thorough wash, firmly squeeze all the liquid from the elderflowers and then discard the flowers. Gently squeeze about half the liquid from the fruits and then discard the fruits. Decant your cordial into a sterilized bottle using fine muslin to catch any floaties. A funnel and sieve are very useful here. This recipe makes one litre of cordial. Enjoy immediately! Goes well with sparkling mineral water, or gin, as well as with plain water, of course. A refreshing and sophisticated taste, perfect for warm lazy days.